In an attempt to boost dwindling support, the prime minister has also signalled MPs could be given the power to decide whether the UK enters the so-called backstop arrangement. This is aimed at preventing a hard border on Ireland until a permanent future relationship replacement is agreed. Mrs May indicated yesterday that parliament could have a role in deciding whether to extend the transition period or enter the backstop arrangement, if no trade deal has been reached by the end of December 2020. And the government is understood to be considering an amendment to next Tuesday’s vote motion that would give MPs more say. But amid calls from senior Conservatives to delay the showdown on the withdrawal agreement and political declaration, Number 10 made clear Mrs May would not postpone it, even though she looks likely to suffer a crippling defeat. As around 30 ministers prepared to try to sell the deal to every nation and region of the country, the Tory leader – who switched on the Downing Street Christmas tree lights last night – said her package honoured the 2016 decision of the British people. She added: “I’ve been speaking to factory workers in Scotland, farmers in Wales and people right across the country, answering their questions about the deal and our future. “Overwhelmingly, the message I’ve heard is people want us to get on with it. Scottish Secretary David Mundell will host a meeting in Glasgow with employers from across Scotland, while Brexit Secretary Stephen Barclay visits engineering companies in Peterborough. The chancellor will be at a school in Surrey, as David Lidington, minister for the Cabinet Office, speaks to small business representatives in Belfast. News of the tour came as Nicola Sturgeon said the chances of stopping Brexit and keeping the UK in the EU are the greatest they have been since the 2016 vote. The first minister said: “I do oppose all and every kind of Brexit, I don’t want Brexit to happen. Meanwhile, Tory Sir Graham Brady, chairman of the backbench 1922 Committee, said he would welcome Tuesday’s vote being deferred if no solution could be found to differences within the party over the backstop. And former prime minister Tony Blair said Mrs May was facing the prospect of “hitting a brick wall at speed” and would be better advised to act as “facilitator” in the search for a Brexit solution which can command the support of a majority of MPs. But Downing Street dismissed suggestions the vote would be delayed, with a spokeswoman insisting it would “take place on Tuesday as planned”. 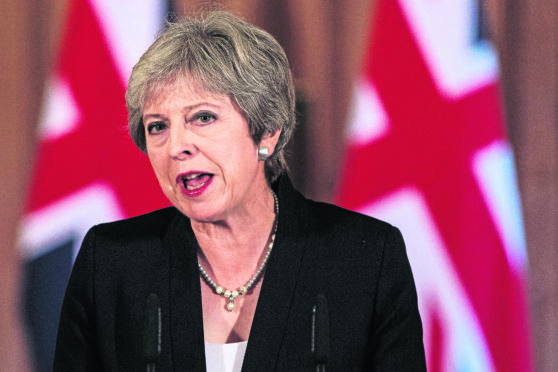 Earlier in the day, Mrs May suggested MPs could be “given a role” in deciding whether to trigger the backstop in the event the negotiations on the future relationship do not conclude in time.